Last Updated: March 19, 2019 · Published: June 13, 2016 By: Asian Caucasian Leave a Comment This post may contain affiliate links or sponsored content. Wow! Close your eyes when you eat this dish and you’ll swear you’re at a Thai restaurant! 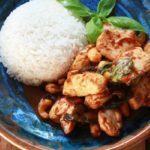 Chicken and cashews have never tasted better together, and yet it’s so easy for you to make in your own kitchen! This dish is bursting with authentic Thai flavors. Round it out with a side of Jasmine rice and a nice cold beer. Ahhhh! To make the chili jam: Place chili peppers, 2 tablespoons oil, red bell pepper, garlic, and shallots in a food processor. Pulse until smooth. Heat a wok over medium heat and add the chili mixture. Cook, stirring occasionally, for 10 minutes. Add in the sugar and tamarind paste and simmer for 10 minutes until the jam thickens. Remove from wok and set aside in a small bowl. Clean out the wok. Reheat the wok over high heat and add the remaining oil. Stir-fry the chicken until browned, about 3-5 minutes. Add to the wok the green onions, cashews, fish sauce, and 4 tablespoons of the chili jam. Stir together until fully incorporated. Stir fry another 2 minutes and top with the basil leaves. Toss. Serve with a side of Jasmine rice. Tamarind paste can be found at select grocery stores like Whole Foods, and specialty Asian markets.